In 1965, Owen Maclaren, British test pilot and aeronautical engineer changed the world when he applied his experience designing the complex folding landing gear of the Spitfire aeroplane to parenting. 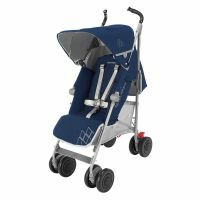 We pay tribute to our aerospace roots with the 50th Anniversary edition Spitfire stroller. 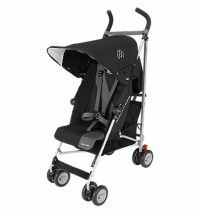 This Techno XT stroller includes whimsical design details and an assortment of coordinating accessories. Quintessentially British Buggy In 1965, Owen Maclaren, British test pilot and aeronautical engineer changed the world when he applied his experience designing the complex folding landing gear of the Spitfire aeroplane to parenting. We pay tribute to our aerospace roots with the 50th Anniversary edition Spitfire stroller. 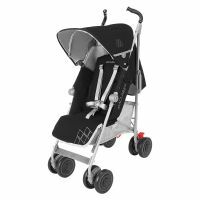 This Techno XT stroller includes whimsical design details and an assortment of coordinating accessories. 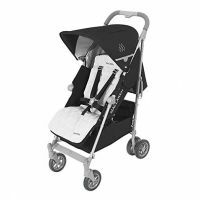 The Spitfire, a Maclaren Object of Design, is a sturdy 6.3kg/13.9lb stroller that pays homage to the WWII British aircraft. 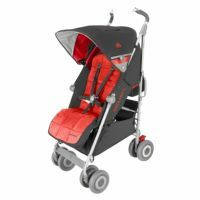 Suitable from birth up to 15kg/55lb, this lightweight stroller offers a reclining seat, adjustable leg rest, 5-point harness and water-resistant hood. Extra amenities include a fun camouflage reversible liner, head hugger, footmuff, raincover, and customised luggage tag. Multiple-position (four) recline for added comfort. Appropriate for newborns and up. 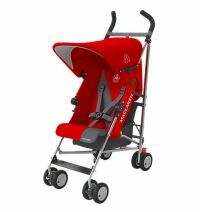 Front/rear suspensions allows the stroller to maneuver effortlessly over rugged terrain. Adjustable leg rest adjusts for desired comfort with memory technology to maintain position. Keep an eye on baby through the viewing window on the hood. Frame made of high performance aluminum, a durable engineering material developed for endurance and lightweight handling. Buckle with two-finger release mechanism to keep children securely fastened in the stroller. Tether strap ensures that stroller is securely tethered to you wherever you go. The washable seat fabric allows you to keep stroller seat clean by simply hand washing and lay flat to dry. Ergonomically optimized handles allow for added comfort and ease of steering. Compact design allows for easy maneuverability through standard doorways. 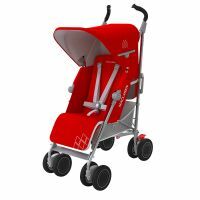 To Recieve updates and possible rewards for Maclaren Maclaren albert thurston buggy please sign in. To Recieve updates and possible rewards for Strollers & Prams please sign in.